MAGRETTE have just opened up a Pre-Order for a new Bronze model, the Moana Pacific Waterman Bronze which will join existing models in the family. The name represents MAGRETTE as New Zealanders along with their M?ori and Pacific Island whanau, and their love of the water. The Waterman Bronze’s finely brushed case makes use of marine grade CuSn8 Bronze so when a patina forms; it won’t be so easily scratched off, forming a sort of protective surface layer. 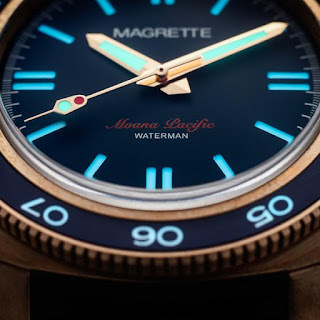 The Waterman Bronze’s patina has been paired to a blue dial representing the surrounding waters of the Tasman Sea and Pacific Ocean. 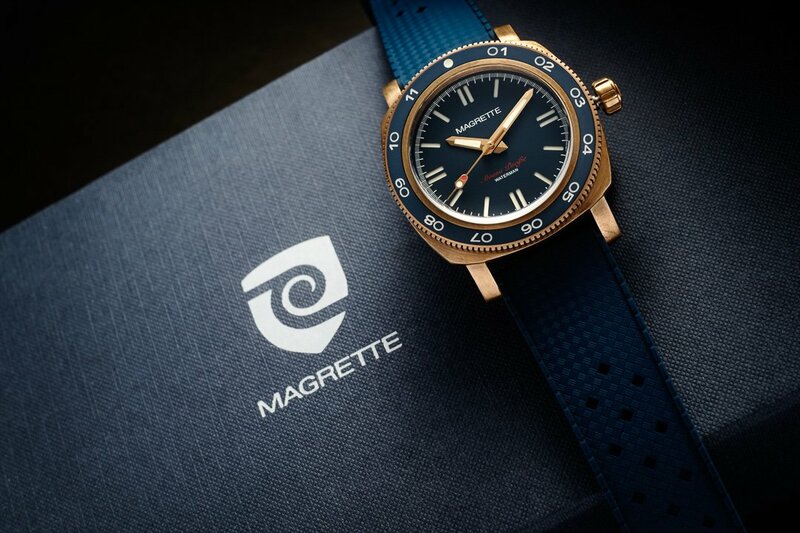 Additional special features of the Waterman Bronze include: a ceramic bezel, a sandwich dial with C3 (hands) and BGW (markers) Swiss SuperLumiNova and a domed Sapphire crystal. Power comes from a Swiss Sellita SW200-1 automatic movement with 28,800 vibrations per hour, 4Hz, hacking seconds and s power-reserve of 38 hours. 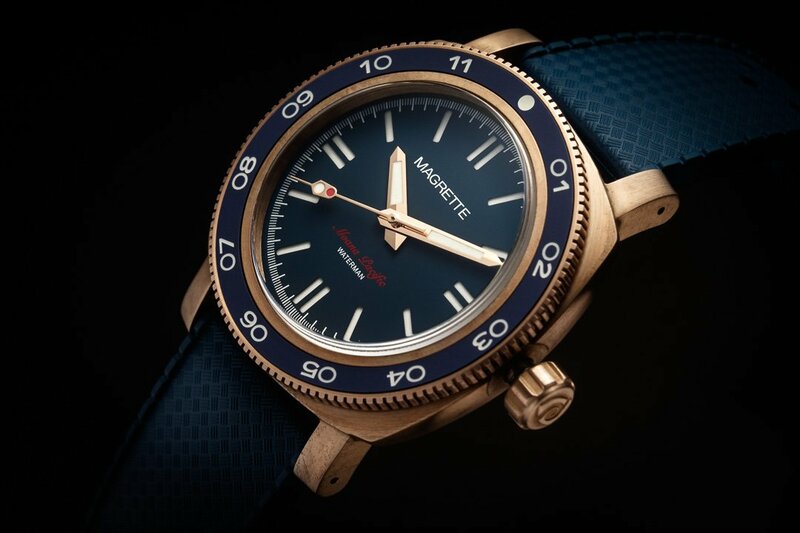 The Waterman Bronze’s case is water-resistant to 500m. It measures: 42mm x 51mm lug to lug, 22mm lug width, 15.3mm tall. 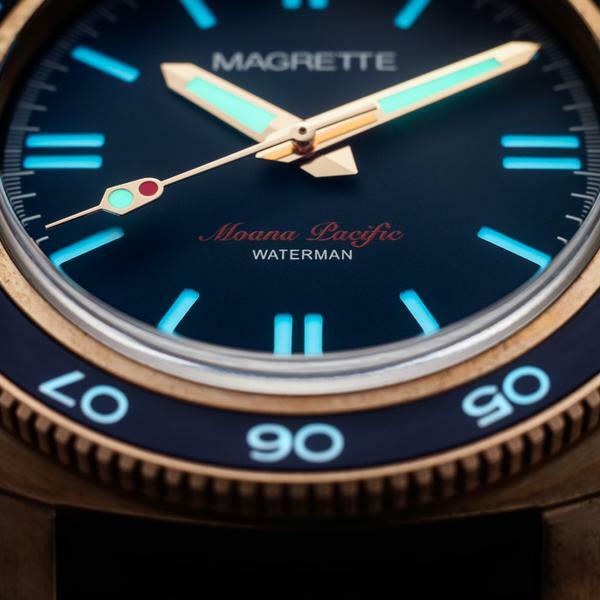 The 1st Edition of the Moana Pacific Waterman Bronze is limited to 500 pieces. It has a special Pre-Order price of 660USD.